CHELSEA COULD BE TOP OF THE LEAGUE BY CHRISTMAS! Without doubt, the next few weeks could be pivotal in the Premier League. 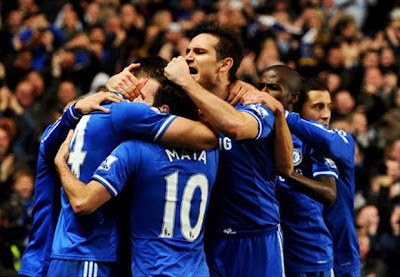 Chelsea must keep winning if we are to put pressure on Arsenal and our rivals. If we do, we could be top by Christmas! After two good victories this week against Southampton and Sunderland, Chelsea must follow up with a win today against Stoke today and Crystal Palace next week before we travel to the Emirates to take on Arsenal. For the Arsenal, playing tomorrow, a Chelsea win today would put us one point behind them before they take on Everton and then Man City next weekend ahead of when we meet on December 23rd! So what about today's game? Well it's winnable based on the squad of players we have and the manager. However, Stoke are always a difficult side to play against and will look to impose their height and playing style against us. Chelsea need to remain as compact as possible at the back, make sure the likes of Ivanovic, Terry, Cahill, Mikel and Torres are winning headers in defensive areas to then hit Stoke on the counter. I said yesterday and will say it again, Stoke are not the most mobile of teams and our attacking three could run riot against them. Chelsea cannot afford any below par performances today and next week. It's times like these that everyone needs to stand up to be counted. If Chelsea can do that and get a win this afternoon, all the pressure is on Arsenal over the next two games.